A man has appeared in court over the death of a cyclist killed in an alleged hit-and-run in Greater Manchester. 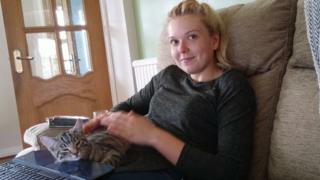 Vicky Myres, 24, died in hospital after the crash in Stockport Road, Timperley, on Sunday morning. Gurparthab Ajay Singh, 26, of Hall Lane, Wythenshawe, is charged with causing death by dangerous driving, failing to stop after a road traffic collision and failing to report a road traffic collision. He is due at crown court next month. Singh appeared at Manchester and Salford Magistrates' Court earlier and was remanded in custody ahead of his appearance at Minshull Street Crown Court on 26 September. A second man arrested after the crash, aged 35, was released while inquiries continue. Miss Myres, who was cycling with her boyfriend's mother at the time of the crash, had recently cycled from Land's End to John O'Groats. Her family, who described her as a "lovely daughter", said her death will leave a void that can never be filled. A family statement read: "Her life was perfect, she lived it to the full and, together with her devoted partner James, they were planning longer and more exotic trips. "It's easy to say your daughter is lovely but she was, both inside and out. "She had everything to live for."